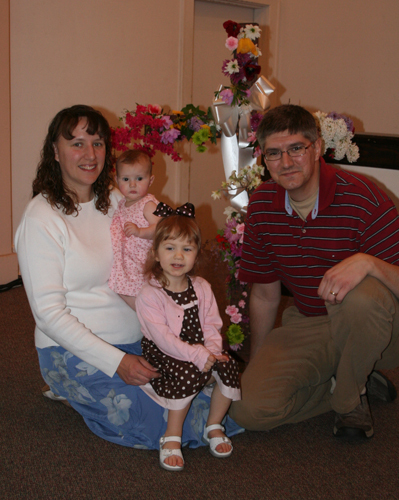 We enjoyed our day of Easter celebration. What a joyful time of remembering the hope that we have in Christ and the redemption He has provided for us! My heart is lightened! Emily seemed to really enjoy spending the day with people and Julia’s first Easter was filled with napping and playing everywhere we went. After church we ate lunch, took a nap, hunted Easter eggs, watched Emily eat way too much sugar, visited, ate again, and then had bedtime. Emily’s eggs were filled with gummy snacks and chick & bunny shaped marshmallows. Yummy!! You have a beautiful family!! I know you feel blessed!! p.s. Bonnie says Hi, too.